[SatNews] Cobham SATCOM has announced at NAB 2014 that its range of EXPLORER terminals for the new Inmarsat Global Xpress network will be available to broadcasters this summer. The Cobham SATCOM Explorer 5075GX. With Global Xpress coverage across Europe and Russia, and regions of Africa, Australia, China and India available from early summer 2014 prior to full global availability of the service in 2015, many broadcasters can soon leverage the power of Inmarsat’s new high throughput services using industry-leading technology from Cobham SATCOM. Global Xpress offers more bandwidth for broadcasters who can deliver high definition content from practically anywhere in the world. Cobham SATCOM’s EXPLORER Global Xpress terminals are focused on mobility and reliability, to ensure reporters and events teams can make the most of the high bandwidth on Global Xpress. Announced at the Satellite 2014 conference in March, Cobham SATCOM’s new EXPLORER Global Xpress terminals join a diverse range of field-proven BGAN and Ku-/ Ka-band VSAT terminals. The new EXPLORER 3075GX features a manual point pedestal whilst the EXPLORER 5075GX is an Auto-Deploy Fly-Away VSAT solution. Both are all new, highly robust designs, developed 100% in-house. They use a new 75cm, 4-segment reflector and are the only Global Xpress terminals available that include integrated Wi-Fi. Additionally, Cobham SATCOM has received Eutelsat Type Approval for its EXPLORER 7100 VSAT terminal, making it the smallest auto-pointing antenna system type approved by Eutelsat for both Ku- and Ka-band operation. Cobham SATCOM's EXPLORER 7100 VSAT. Already established as a vital tool for satellite news gathering (SNG) vehicles, the ability to use Eutelsat’s KA-SAT services with the EXPLORER 7100 is a significant new capability for broadcast users. In addition to Eutelsat KA-SAT services, the system also works on Ka-band networks from SES, Avanti, YahSat, Arabsat, ViaSat and Hughes, as well as major Ku-band networks. 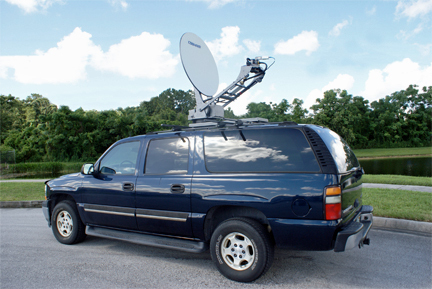 With high levels of bandwidth available on Ka-band, using the EXPLORER 7100 broadcasters can stream or deliver high definition video and audio from the most compact, Eutelsat approved vehicular antenna available. 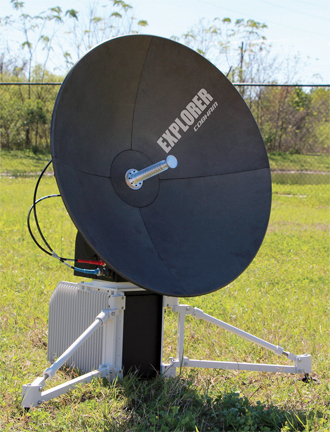 The EXPLORER 7100 is a 1.0m multi-band, drive-away antenna for Ku- or Ka-band operations. Switching between Ka-band and Ku-band takes less than 5 minutes simply by exchanging the feed assembly using an easy-to-remove feed mounting plate. The auto-deploy system allows personnel with minimal satellite experience to easily configure and operate the terminal, enabling users to access any broadband application over satellite. The EXPLORER 7100 uses a Solid Resin Fiber Composite Reflector, which is tougher, with a much longer lifespan than traditional metal dish reflectors. The high geometrical accuracy increases RF performance and provides superior rain fade mitigation. A rugged pedestal with unmatched pointing accuracy with zero backlash or deflection in windy conditions helps to ensure a stable, reliable connection in adverse weather. While ideal for use on SNG vehicles, the EXPLORER 7100 is also used by government and humanitarian organizations, thanks to its ease of set-up and operation and high reliability in the field. Plus, Danish broadcaster TV 2 has upgraded its entire BGAN terminal arsenal for outside broadcasting to Cobham SATCOM’s EXPLORER 710. TV 2’s news gathering and events coverage teams now have access to the most advanced mobile BGAN terminal available, supporting their ability to live-stream and deliver high quality content from the field. 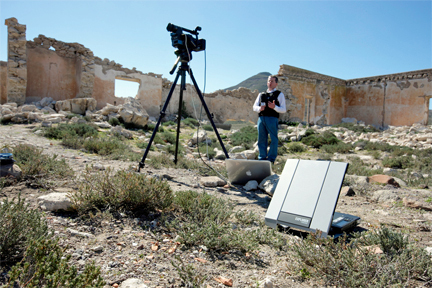 Cobham SATCOM's EXPLORER 710 + BGAN HDR, an ideal combo for highly mobile outside broadcasting. Originally unveiled at NAB 2013, EXPLORER 710 is the first terminal to enable the new Inmarsat High Data Rate (HDR) streaming service. BGAN HDR provides a minimum throughput of 580kbps with its full channel option, but users can expect to see an average speed of 600-700kbps, reaching as high as 800kbps. TV 2 was part of a successful testing program with Cobham SATCOM and has since recognized that EXPLORER 710 and the HDR service can significantly enhance its programing through a combination of mobility and high bandwidth. “It’s essential that we have reliable, lightweight and compact equipment that enables us to deliver the story from anywhere. We chose EXPLORER 710 because we get these physical attributes and a significant bandwidth boost through HDR streaming, which gives us greater flexibility in the field and results in our ability to provide higher quality content for our viewers. The EXPLORER 710 is also by far the fastest terminal to setup and get connected to the BGAN network,” says Morten Brandstrup, Head of News Technology, TV 2 News. As the world’s smallest and lightest Class 1 BGAN terminal and the first platform to make use of BGAN HDR streaming as standard, the EXPLORER 710 is positioned to support broadcasters in enhancing the quality of mobile outside broadcasting. As well as enabling the fastest BGAN live streaming ever, EXPLORER 710 introduces Smart Phone apps to the world of BGAN connectivity, enabling users to connect their own devices for voice calling and connectivity.